Talked about it with some in PMs or various threads, but I'm just going to make it the subject of it's own thread and see what discussion can arise and if maybe more perspectives can be shown. A. It will limit the potential for new stories and thus resulting in having to end the story: This I believe is the big reason why this particular change has yet to occur. Now if there are some really substantial stories in the future that can't work with Ran in the know, then ok. But if it's something like the 5th, 6th, 7th and so on rehash of "Ran has stumbled onto Conan's secret, now he has to pull off a jerkish move to throw her off" or to have yet another moment where Shinichi and Ran end up in such an intimate situation, we've been down both roads before. So yeah lets try some growth. Or looking at the standard cases that Conan solves as Kogoro, compared to the earliest episodes with this structure, Ran barely gets in the way of Conan nowadays that her being aware, wouldn't really hurt the formula that much or at all. More on why I consider this to be a poor reason in a bit. Though as we are close to 1,000 episodes and files, I think Gosho should consider swallowing his pride and let the proverbial child grow. Even at 500 episodes and 600 files this status quo needed to die, but again later. B. It would mess up the status quo for the movie going audiences in the films: It wouldn't be the first anime series with movies to do so, and it's not that complicating of a change. Especially with the opening which gives exposition for said audience. C. Ran and Kogoro will be in danger: Basically the biggest reason in story, with the mindset that if the organization finds out who Shinichi is, they'll sort out who else knows said secret and kill them. But, the manga/anime demonstrates that Gin or any other member would be more likely to kill someone connected to the target without taking the time to see if they are aware of the organization or not. More on this in Pros 5, though there's another thing to consider in this regard. If anything, living with them is more likely to make them a potential target than whether they know his secret or not. And considering he has other means of getting a lead, such as the connections that his own father has, it means he doesn't have a valid reason for staying with Ran & Kogoro other than ego and status quo. D. Ran would become a hindrance (i.e. trying to help out, only to get in the way) or that Conan will let his guard down around her and compromise his cover: Yes and no. One reason for no, I'll cover in the pros list, but another rebuttal to this is that it works both ways. Lets look at Episode 522 for example. Shinichi has to make a getaway from Ran, Kogoro & Kazuha before he reverts back to Conan and barely avoids getting caught, while having to have another antidote. Then the next episode has him in the same situation, only on the highway with more people who would witness the transformation. So, basically if Ran was in on the secret by Episode 522, she and Heiji would have stood a better chance at helping Shinichi to perserve his secret and maybe even negating the need to have that antidote. Heck, look way back in Episode 10. For a quick recap, a girl named Ryoko Akagi came to the detective agency and was hoping to find Shinichi as she apparently is his girlfriend. (which was really her trying get his attention for help in finding a missing person). So Ran and Conan goes with her, back to her home. Conan shortly after, hides in the bathroom to call this client as Shinichi. Needless to say, Ran thinks that Shinichi has been seeing this girl, and upon finding that he is actually in the house tries to enter the bathroom to corner him. As such, Conan has to spend quite a bit of time dodging her, and soon after, running out to conceal his secret. So yeah, keeping her in dark is necessary to prevent her from becoming a hindrance indeed. Now you might be telling me that it would result in the case in Episode 523 being less impressive because we would have no Shinichi. True, but I'm going to address that in my list of benefits of changing the status quo. Next time my friend, next time. E. How can Ran be of help to Conan and everybody if she is superstitious? While it's odd to think that Dracula and the Legion of The Undead will invade Tokyo in the Detective Conan universe, Ran being superstitious hardly indicates that she will compromise the team. She's allowed to have her flaws afterall, plus while Conan barely is painted in a negative light today, there was a time when Gosho allowed the character to feel more like a real flaw person. Lets look at a handful of older volumes. - Volume 1: Right off the bat, the whole reason he's in this mess is because he thought he was intellectually above everyone (aside from Holmes perhaps), and got hit with a lead pipe on his head. Heck, Volume 2 even has Agasa without any sarcasm or ribbing remind him that part of Holmes success is being more levelheaded and that rushing into situations would be stupid. - Volume 5-6: For starters as Volume 5 end and 6 begins, Conan is apparently caught by two Organization members who found him out and are about to kill him, only to find out that they are his parents, despite certain clues of their identities. But hey he thought he was in danger, so that's understandable. And later in 6, he makes the wrong judgement again when he finds that the "kidnappers" he, Genta and Mitsuhiko pursued were just rehearsing lines for a play and had to help out because he injured one of them. - Volume 7: Moonlight Sonata case. The one where he prompt the murderer into suicide and to this date is the only mistake in the entire series that he actually reflected on (see Volume 15-16). - Volume 11: Despite developing a fear of Eri, is unable to recognize her until Ran says "Mother". - Volume 9 and 15: Nothing to do with the cases, but it's nice to see that the hero can't do everything and that his singing is probably the most lethal weapon on the planet. Yeah despite what the author tries conveying today, Conan wasn't quite the wonder boy initially. He's suppose to be the Modern Day Sherlock Holmes and he made plenty of amateur mistakes. Also lets look at Heiji Hattori one of the more trusted secret keepers. Yeah he frequently refers to Conan as Kudo in public and yet nothing of consequence has come of it. F. Doesn't Ran seem to be the kind of person who wears her heart on her sleeve? Perhaps. I mean in Volume 60 she almost drops mention of Shinichi to Subaru Okiya. And every time she shows suspicion of Shinichi and Conan being one and the same she is unable conceal her knowledge in the end and Conan is able to find a means to throw her of his trail. So maybe she would be a liability in helping to keep the secret right? I still think she has potential that if nourished, would result in her possibly being the best ally. Lets look at some crucial details. Volume 14 starts us off with the second occasion where Ran's suspicions of Conan are back in full front. And said suspicions are dropped when Yukiko shows up and gives some BS about how Agasa is a distant relative of the Kudos and that Conan is actually her second son. So naturally Ran is satisfied enough to drop her suspicion, right? Maybe not. After Conan's parents take off, they suggest that he shouldn't underestimate that girl. Fast forward to the last few chapters of Volume 25 and we have Ran & Conan needing to go over to Agasa to use his shower and Kogoro suggests that Ran and Conan should bathe together which prompts her to get jumpy. Probably because Ran realizes that Conan is her teenage friend. Well she screwed up her intention of not tipping him off already hasn't she? Not as much as one would think. First off she didn't just develop her suspicion at the beginning of File 251. She maintain her suspicion from the last time in File 138. Hints of this is shown as File 254 comes to a close. Conan is contemplating whether he should keep lying to Ran or tell her everything. During this he recalls what his parents said to him back in File 138 about how he shouldn't underestimate her. Furthermore, he reflects back to Volume 23 file 229 where Ran tells him not to go off by himself anymore because she was worried. She basically was treating him as a peer rather than a little kid. So basically while Ran actually did slip up in that particular moment, our Modern Day Sherlock Holmes didn't pick up on the reason for that behavior until 24/25 chapters later. More importantly the flashback to File 138 and 229 demonstrates that Ran has retained her suspicion of Conan's secret for basically 142 chapter/10 volumes before her big slip up. Considering she's an average superstitious girl without a group of people to help her to crack the mystery, that's not a small accomplishment. She would need to do better in the future to develop a better poker face, but if she was trusted and given some help to work on that she could become a valuable ally. The Pros for short are why I'm strongly insistent that the Cons don't work so much these days or even as this decade start. They also arguably prove that this changes is the ultimate means of having your cake and eating it too in changing things drastically to generate unexpected excitement while not bringing it to an end. Think of this as a crude planning of what would go on for the first portion of the Bourbon arc between up to the end of the London trip. A. Yeah, sometimes people need to make hard choices for the greater good, but the ends don't always justify the means and sometimes the hero must not always slay the dragon to earn their happy ending but dealing with their own dark side. In other words even if Shinichi/Conan and Ran's relationship to be is suppose to be viewed as healthy the length of her being kept in the dark doesn't help some to see it that way. I mean I look at all Shinichi/Ran moments from the flashback to his first case up to the last day they spent together before well The Big Shrink. Still a sign of a relationship that needs time to grow, but I actually see these two feeling like a team. Equals. Compare that to the present where he is in deep and she is being deceived because of the unspoken policy that the love interest to the main character must only be on the sidelines. It would be problematic even if Gosho kept to the original game plan of the story being 7 months long, but the more this is kept from changing the more problematic feelings that arguably come from it. Having the development occur sooner would mean reducing this unintentional vibe and help to make the two feel like partners and equals. And frankly considering that we'll likely see the series ending around episode and file 10,000, waiting for the end to let Ran in on the secret doesn't allow any justice done for her reaction or the emotional consequences of Conan's actions. B. It would seriously help both characters become better even. Ran uncovering the secret and being brought into it means she gets more to do, and it would serve as a way to give Conan a chance for more humility by realizing that sometimes a person can be harmed by their loved ones emotionally than any physical damage brought on by the bad guys. - Now to give Conan some understanding, while he and those helping him might have gone overboard at one point or another with the whole secrecy thing, keeping it is still important to a point. To illustrate such a detail, there could be several occasions where Ran's newfound involvement has her dealing with the irony that she was once being lied to in the interest of protecting everybody, now she has to contribute to that lie whether the person stumbling onto the secret is an acquaintance, friend or family member. Heck, this could be the reason why she might be willing to grant Conan forgiveness to begin with and help her with having perspective on the matter. Also an example of this, well the Shiragami story. I still find the first two episodes (521-522) to be decent for reasons stated, but I really find that 523 is really the weaker part as it really doesn't even try make the proverbial journey interesting. At best it's something we don't see often, but other than treading old grounds without much to offer, meh. Heck, The London arc had that love confession going on afterwards. More on this in a bit. But yeah one major change for Episode 522 is that it could even be the first time where Ran isn't only keeping the secret, but has to help Heiji to actively keep others (Kogoro and Kazuha) out of the loop. What's more is the delicious sense of irony of the two main characters. One has to learn to ease up on the secrecy, while one has to practice to help maintain it. Irony and and opposite developments. - So what to do with Episode 523? Well we'd be without Shinichi story which would mean average mystery case right? Wrong. This could be say the first of many future cases since the Ski Lodge Murder Case (way back in Episode 84-85) where Ran steps up to help Conan (and in the case of this ep, Heiji) solve the case. So within the new and improved version of the Shiragami arc for example, Ran not only has to deal with hypocritically being dishonest to her loved ones, but gets to shine by helping to solve a case. - Though other characters also help in this regard, but there's more of a chance for Conan to grow out the mentality that he knows what's best and that sometimes he has to trust that Ran's presence will be more of help that hindrance, just as Ran has to occasionally accept that she can't always help Conan in a direct fashion. 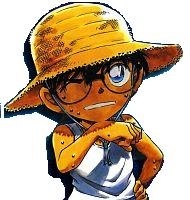 - Relating to A and B, I don't care to see Ran post-confession hating and snubbing Shinichi/Conan cold turkey. But for the time being there's the coping aspect to the whole thing. Conan needs to accept that he caused Ran more pain than he tried to protect her from, while Ran not hating Conan is still coping with the fact that she was lied to and not trusted. While I don't know how to have it come about, maybe keep this as the status quo with things relaxing between them during the London arc as it would be one of the few stories to be heavily altered, thus allowing that arc to still have something to use for an emotional moment. Maybe near the end when Conan briefly becomes Shinichi, include a nice moment where the two decide to talk for a while and have their first friendly & honest conversation (i.e. talking in person without a voice changing device and no lies between them) since the whole Apotoxin thing happened. Yeah that was channeling a bit from Mystery of Conan Edogawa. - That said, out of all secret keepers, Agasa and Haibara definitely influenced Conan more in regards to keeping things from Ran. Conan still likely kept the charade of his own accord as he occasionally would go around their backs as well (i.e. keeping Haibara in the dark about Akai being Okiya or telling Eisuke his secret just to keep him away from Ran of all things), but their insistence on keeping quiet seems to have influenced his decision. I agree that letting Ran find out the truth would be good for the story. I absolutely agree that the reasons given by Asada and Haibara for not telling her are wearing extremely thin at this point. In the beginning, when Agasa first suggested that he should keep it secret from everyone, the reasoning was sound, but with all the people who have learned the truth throughout the course of the series and the fact that not a single one of them has been put in danger because of that knowledge, it strains believability that even Asada and Haibara still think knowing would endanger Ran. I find it more likely that their reasons have evolved over time. Haibara is obviously a manipulator who draws some strange delight from getting people to do what she wants rather than what they want or need to do. On top of that, there is the possibility that she has developed her own feelings for Shinichi over time, and she realizes that Ran learning the truth would ultimately being Ran and Shinichi closer together; so in addition to the pleasure she draws from coercing Conan to keep Ran in the dark, I think a part of it, though she would never admit it (probably not even to herself), is that she doesn't want him to get closer to Ran. As for Agasa, I can't help but wonder if the knowledge that he is one of the few main players that is in on the secret gives him some sense of power or importance. I mean, before the whole ordeal started, he was pretty much just a washed up failed inventor. He was Doc Brown to Shinichi's Marty. A crackpot that nobody gavemuch creedence to. But now, he has become one of the most important people in Conan's life; any time Conan faces a new problem, it is Agasa who he turns to for some gadget that can provide a solution. Because of what happened to Shinichi, Agasa is now important. But if Ran were to discover the truth, that might infringe upon Agasa's importance. Ran is a fairly smart girl, and has skills of her own. If Conan were able to turn to her in a time of need, he wouldn't need Agasa as much. A perfect example is the kick power enhancing shoes. Agasa developed these to compensate for the lack of strength Conan had in his child's body; but if Conan had filled Ran in on the truth, he wouldn't need this, instead he and Ran would act as a team and she could use her martial arts skill to take down opponents. So Agasa might just have some kind of job security and/or self worth issues that are assuaged by his importance to Conan, and he doesn't want to give that up. - Ok, one possible consequence is the serious removal of heartbreaking drama. First by removing the wall of secrecy between Conan and Ran, plus the eventual moment where their (currently platonic) relationship starts to mend and become stronger. So we end all potential tension right? Isn't that cute, but it's WRONG!!! (2 Stupid Dog reference:-)) All jerky kidding aside, yeah while the characters aren't perfect in terms of morality, I doubt Ran is going to try to be intimate with a 6 year old boy, even if said boy is her age. In other words, You have a much more compelling bit of tension which doesn't have any easy solutions, unless you consider getting a permanent Apotoxin cure or defeating an Organization is easy. Ran and Conan might have a stronger relationship with the secrets/lies gone, but until Conan is permanently cured and the threat is over, they couldn't really act on their feelings beyond friendship. There's enough tension to be found when two people love each, but are kept apart from each other both literally and figuratively. Just image being together in proximity but having to deny the deeper feelings for one another. Seriously why fallback on lack of communication as a source of drama when a much stronger and challenging one is basically given to you in a pretty box, free of charge? D. Not much to say here other than such a change helping to give the illusion and feel that anything can happen despite certain elements that do need to remain status quo. *Dealing with what's arguably unfortunate implications (lack of trust, respect and love). *Making two of the main characters even better, plus giving one more to do with screen and panel time with more of an agency. *Helps to lessen any chance of creative reduction. *Replaces cheap source of tension with real drama for what's left of a continuing series. *Gosho might be under the impression that this development will herald the end of the series, but would ironically result in him having some stronger padding. So much that you could use the series as a nice cushy bed and sleep like royalty. *Also, loads and loads of irony. Can be funny or just plain good for the soul. So have the Cons weakened as points overtime? Or do the Pros overall work as a reason as to why change should have been implemented or do they have a downside? Re: The Cons and Pros of Ran Mouri learning the truth. All those cons are easily thrown away and replaced by pros, just like you just did, so I really only see pros about Conan finally telling Ran. I'll be disappointed if she isn't either told everything or doesn't prove his identity until the end of the series as (and I've said this a few times before) it'd bring a lot of small changes that can be both fun and exciting. It's such a wasted opportunity. I think the only good reason he ever had not to tell Ran was that she worries much more about everyone else than herself. He didn't want her to worry about this big, powerful organization who'll kill him on sight. But that isn't a good reason anymore. He keeps avoiding talking to her about the case (which is not like him at all), he doesn't want any credit for cases he's recently solved around her (also absolutely not like him), and he doesn't want anyone to talk about him. She's knows he's in big danger. With her imagination, it's probably worse for her not knowing exactly what's going on. I don't remember if Ran is good at keeping secrets and telling lies that she's prepeared for. She is a disaster when it comes to improvising lies on the spot, but if Shinichi had bothered to give her a cover story for when people ask her about him instead of just saying "don't talk about me to strangers", she might actually be really good at it. One thing I really wish happened in the latest case when Sonoko mentioned Conan's behaviour during the school play, is that Ran could have suddenly and easily just told a lie about him always being like that when he's sick. 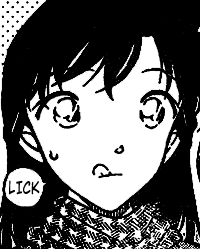 I actually looked through volume 25 a few days ago, and I couldn't for the life of me figure out when Ran started suspecting Conan. I thought it'd be the chapter before. At least not more than four chapters. I never would have guessed it was 142 chapters earlier. My favourite part of that series. XD Thank you for the remider. I think the problem might lie in the ending of DC. Gosho has a clear idea (or at least that was what I heard from his interviews all the time) about how it'll end, and he might keep the Conan is Shinichi revelation to the end. I do think it would give a different dynamic to the story and it wouldn't hurt it. I'd actually love to see that. But it is hard to tell which decision is better until DC is actually finished. Misztina wrote: I think the problem might lie in the ending of DC. Gosho has a clear idea (or at least that was what I heard from his interviews all the time) about how it'll end, and he might keep the Conan is Shinichi revelation to the end. That is the only decent reason I've seen. Though the ending gotta be pretty darn great to make up for everything we could have had. The entire keeping Ran in the dark is just a story technique to add drama and make it longer. If Conan was a rational human, at the end of ep 1, he would call Ran and tell her what happened and then call his parents in LA immediately after notifying that he's been targeted and shrunk by an international crime organization. Daddy will fly back to Tokyo and with his $$$ and contacts, track down the Gin and Vodka (how hard is it to find two dudes, one blond, in black trench coats in ****ing Tokyo and driving exotic cars like Porshe 356A) and the series will end by episode 3. There will be no need to protect Ran by keeping her in the dark since Yusaku will b****slap the entire organization before long. Which I addressed on the last comment on Pros C. You know, where they have to cope with the fact that they are together, but can't act on those feelings because of artificial age difference. How could that not be good drama? Feels like we're already had this discussion before... So basically I mean drama as in it makes the situation artificially harder for Conan. If you think about it, Shinichi has way too many powerful allies even at the start of the series and by keeping everything to himself he's effectively nerfing himself and that's what drives the plot. If Conan tells Ran (which again is something any rational human would do), then why stop there? There's no reason why they wouldn't get Sonoko & Ran's parents involved as well (and that's assuming Yusaku isn't involved for whatever reason). Then the entire story will be completely different. There's no reason for Sleeping Kogoro anymore, which is a central recognizable gag in the franchise. Shinichi and Sonoko aren't exactly BFFs, but Shinichi is Sonoko's long time childhood friend and Sonoko's best friend's not-boyfriend that she should bring the entire Suzuki conglomerate to Conan's side as well. And again, this is assuming that Yusaku isn't even involved. Of course, you might also be suggesting a scenario that Ran knows, but hides it from her best friend and/or family, but that's its inviting its own slew of issues. Your Pro C and other points didn't comment on Sonoko's involvement at all, who I think would be a central figure in this scenario, so I'm not entirely sure where you stand here. On a sort of related note, you know what'd be awesome? If Conan, since technically he's 16/17, started growing facial hair and that derailed his attempts to hide his identity. thriceplus wrote: The entire keeping Ran in the dark is just a story technique to add drama and make it longer. That was definitely the reason at first, but after 30-40 volumes, it was so overused it didn't do anything anymore other than being boring. It took away drama and made the it shorter. It's like if every other murder involved the exact same trick. Changing it would add drama and making it last longer. thriceplus wrote: If Conan tells Ran (which again is something any rational human would do), then why stop there? There's no reason why they wouldn't get Sonoko & Ran's parents involved as well (and that's assuming Yusaku isn't involved for whatever reason). Then the entire story will be completely different. There's no reason for Sleeping Kogoro anymore, which is a central recognizable gag in the franchise. Shinichi and Sonoko aren't exactly BFFs, but Shinichi is Sonoko's long time childhood friend and Sonoko's best friend's not-boyfriend that she should bring the entire Suzuki conglomerate to Conan's side as well. And again, this is assuming that Yusaku isn't even involved. 1. Well to start with the last bit of the comment I quoted, I do think the secret does have merit and there has to be some people not in the know, but Ran and Kogoro giving Conan shelter would likely put them in the spotlight should say Gin find out about Conan through other means. 2. And yeah, truth be told, Kogoro knowing wouldn't bother me a bit. Aside from the reason stated, while it's true we've seen he has potential to work well in law enforcement, I feel that it's not enough for him to solve 25% of cases of the entire series. Really the only way he could convincingly improve is to have the cases he solves or is able to observe would need to increase (at least 45%, if not 50%). But compared to "Ran stopping Conan from getting in the way of the grown ups", the Sleeping Kogoro still is used more often and it's removal (or modifications through Kogoro pretending to sleep) would have too much of a change on the status quo for the liking of Gosho, the editors and/or the fans who love the formula. Heck, going meta, I tend to focus on Ran because aside from Conan/Shinichi she's the one who appears the most whereas it seems the manga will actually give Kogoro and Sonoko breaks in panel time. So yeah I don't think representing the perfect Japanese housewife is enough to merit the amount of appearances she had. Ran finding out about it on the other hand is more a middle ground in changing things significantly, but not to the point of removing the formula. What I'm suggesting mainly is Ran being able to somehow come to the conclusion herself. Just as you point out that Conan telling Ran is the realistic thing for him to do, I think by the 4th suspicion arc, Ran would know better than to approach Conan in a fashion giving him time to conceal his evidence. And I think if him and Shinichi appearing at the same time wasn't enough to kill her suspicion, then the cell phone trick shouldn't be enough either. Plus as I stated, each time she has a suspicion of Conan being Shinichi, she always has to act obvious for him to notice, meaning that she's been able to develop said suspicion without Shinichi himself immediately noticing. Especially during the Desperate Revival Chapter 1 Episode 188 (Volume 25) which if the manga flashback is correct, she's held onto said suspicion since Episode 96 (Volume 14). And at the very least both anime and manga flashback to The Twenty Year Old Murderous Intent: The Symphony Serial Murder Case which is Episode 174 (Volume 23). Yeah though if you're willing to make changes to begin with like stretching the story out from half a year to a couple decades or more, you sometimes need to be open to changes to accommodate that choice. Considering how Ran was arguably more active in the early volume, letting her find out on month 5-6 could be doable. 10 years even with the frozen timeline is pushing it. And really I tend to think at late it should have been sometime after the Vermouth arc as it feels more natural for her change as she had more involvement in the arc. Plus the fact that he added characters not planned (Sera), yeah I think he forfeits the artistic integrity claim.